Hi friends! In Karber Shop! We have a Special for our customers. From Wednesday 2nd to Saturday 5th of March, If you spend 10 USD or more you will receive a free digi! 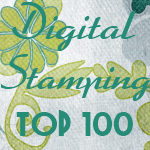 Easter Millie digital stamp!